Remain eco-friendly in 2014 by contacting us for a green remodeling. Do you want to upgrade your bathroom or kitchen AND be environmentally responsible at the same time? 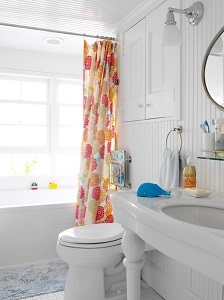 Many homeowners hate the thought of expensive replacement of tubs, tile, vanities, sinks and countertops. Even worse, is the unnecessary waste of throwing away perfectly functional fixtures and filling up the local landfill. Miracle Method has an eco-friendly renovation process that will restore your bathtubs, countertops, and tile to like-new, while saving up to 75% off the price of what it would cost to replace them. The Miracle Method process repairs cracks, chips and scratches before adding a new finish to effectively extend the life of an old fixture for up to 15 years or more. We can change colors and give you a completely updated look without the mess of replacement. Best of all, most refinishing jobs are completed in just two days. Miracle Method was “green” way before it became popular. The Miracle Method process effectively “recycles” all types of tubs, tile showers, vanities, sinks, and even kitchen countertops. If the fixture is functional, then our process can restore it and make it beautiful! For the past 33 years, Miracle Method has restored and refinished literally thousands of bath and kitchen fixtures. In fact, we’ve calculated that by using the Miracle Method process, we avoid filling about 100 pickup trucks and sending them to the dump…each day! Don’t replace it! We can save you money and help reduce the negative impact on the environment if fixtures are thrown away and costs are incurred to manufacture and install new ones. 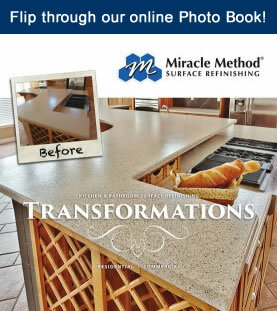 Contact Miracle Method to start planning your 2014 green remodeling project.